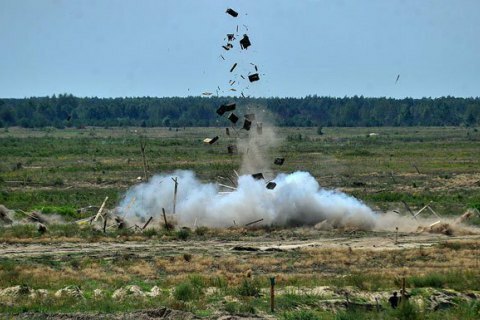 An arms explosion near Maryinka, Donetsk Region has killed two Ukrainian servicemen and left five others wounded, the antiterrorist operation (ATO) HQ has reported. "At around 0400 [Kyiv time], fighters of illegal paramilitary groups started barraging Ukrainian fortifications near Maryinka. The ATO forces covered the enemy with dense fire. In the course of the confrontation, one of the weapons went out of order and exploded. As a result of this tragic incident, two Ukrainian servicemen were killed and five wounded," the ATO HQ said. As reported earlier, one serviceman was killed and five wounded at a shooting range in Kyiv Region on 4 August as a result of a shell explosion.